Best selling mystery author and part-time Seattle resident J.A. (Judy) Jance will be at Third Place Books in Lake Forest Park on Tuesday with the newest suspense novel in her Ali Reynolds series, The A List. Jance originally lived in Seattle and set her books here in actual places which she didn't try to disguise. It was always fun to read about scenes that I knew and places I had been to. One time she contributed to a charity auction. The winner would get written into her next book. The winner was the wife of a well-to-do professional man. Her huge home on Magnolia wasn't terribly convincing as a scene. However, turns out that her hobby was salsa dancing which she did every week at a Mexican restaurant in Wallingford where I had lunch several times a week. 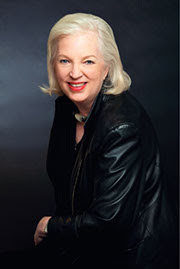 Jance started spending time in Bisbee, Arizona, where she was raised, and suddenly there were book series set in Arizona - Joanna Brady who took her husband's job as sheriff when he was killed; Ali Reynolds who loses job and husband and goes to Arizona to help a childhood friend; the Walker Family - four books in an interrelated series. She has written around 60 books in four different series. J.P. Beaumont is a Seattle police detective - there are about two dozen books in this series, alone. One of the most dramatic scenes was set at Snoqualmie Falls at the lookout over the falls. It's dramatic in the book, but even more dramatic if you have been there (I'm never going back. Not going to walk on glass floors either). My favorite story about Judy Jance involves a J.P. Beaumont mystery and how it saved a man's life. The Seattle man usually went to bed at a sensible time but he was so enthralled with the Beaumont mystery that he was still reading at 3am when he smelled smoke. His house was on fire. He told the Seattle Times that Jance had saved his life. When she came back into town, she took him out to lunch. J.A. Jance, Tuesday, April 9 at 7pm at Third Place Books Lake Forest Park, upper level Town Center, intersection Bothell and Ballinger Way NE, LFP.